If you have purchased a domain from a domain registrar called Namecheap and you intend to keep the domain registrar as Namecheap, then you will need to change the domain name servers in the Namecheap interface in order to use your domain with InMotion Hosting. The following tutorial will guide you through making the name server change within the Namecheap interface. Click on Account in the menu in the top right of the screen. You will see a pop-up menu. Click on Domain List. 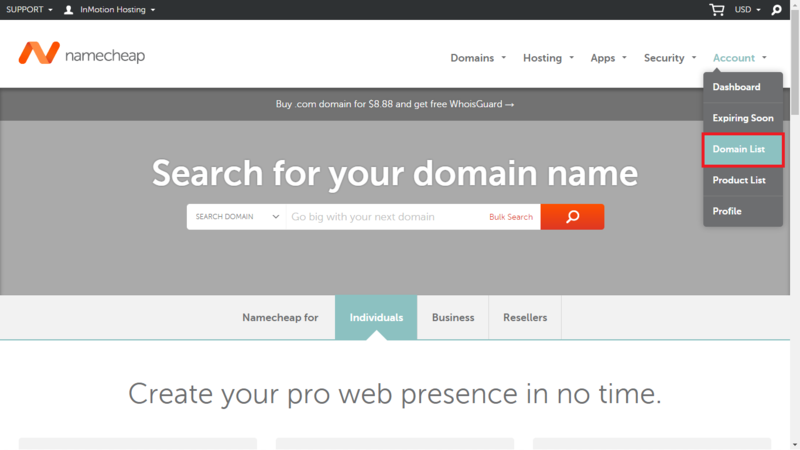 This will show you a list of the active domains that you have purchased through Namecheap. 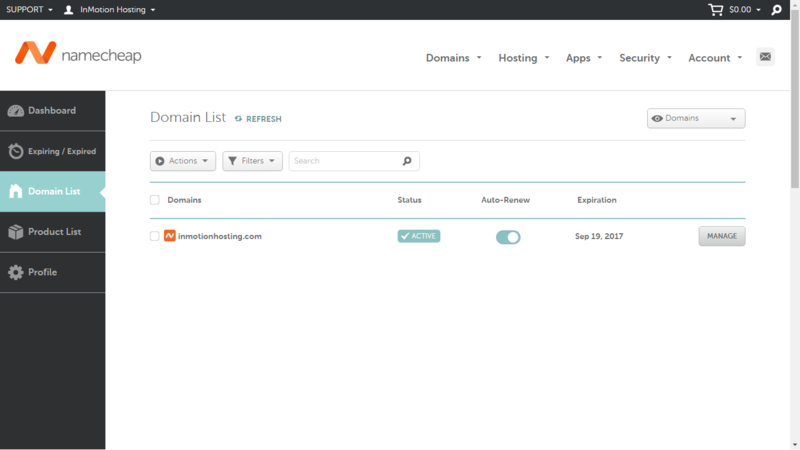 Click on Manage for the domain where you want to change the name servers. Scroll down until you see the section for Nameservers. Typically, you may see two name servers already listed. Click on the line to edit them. 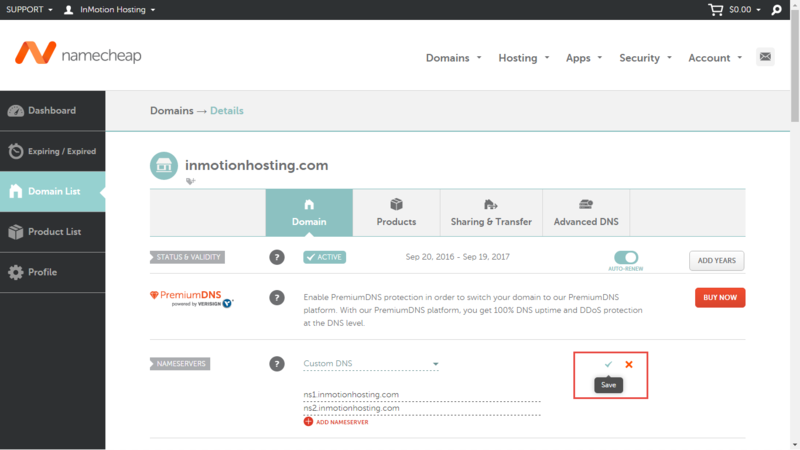 If you are using InMotion Hosting's default name servers, then you will add the following: ns.inmotionhosting.com and ns2.inmotionhosting.com. If you are adding custom name servers, then add your own name server names in this location. If you have more than 2 name servers, click on ADD NAMESERVER to add another name server setting. Once you have completed adding your name server, click on the check mark next to the red X that is located to the right of your name server settings. If you hover over the checkmark, you will see that it says SAVE. Congratulations! You have completed adding your name servers in the Namecheap interface. Remember that any changes to DNS may require up to 24 hours of domain propagation in order for the change to take effect. Hi, I have followed the above adding ns1..... and ns2....... How do I get it onto my cpanel to then create a website? Pointing your domain to our nameservers will cause your website to resolve to our servers. You can then log into cPanel and begin building your website. Typically, you will want to install WordPress, or BoldGrid if you are starting a new site. How does this works when I want to move my domain made at WIX? I am just interested to get my domain to point to my possible site at Inmotion since my domain is already paid for another 2 years. The reason I ask is that Wix seams very dificult when you want to leave them. I reassigned my Namecheap domain to the default InMotion DNS, and it has been 48 hours, but my domain is not showing that it's finding a DNS. Should I have a custom DNS somehow? If so, how do I make/find my personal DNS to link my domain to my account? I have domain in namecheap, I have activated the premium DNSHow to configure to address my hosting of InmotionHosting? Thanks for the question of configuring your DNS for your domain through Namecheap. We don't know what you're trying to do with the DNS in order to give you advice. Are you trying to point the domain to our hosting service? If that is the case, are you pointing both email and web traffic? Do you simply want to change the name servers? Do you need to make other DNS changes? You need to specify what it is that you're trying to accomplish by configuring the DNS, and we can try to give you an answer. Please clarify and we would be happy to help! Hi, The page at namecheap has changed and looks much different. It will be much appreciated if you can take a look at the page and update the content accordingly. Thanks. Thank you for your suggestion, we will try to update this article as soon as possible.